At no time in your child’s life will changes occur so rapidly as they do during the first year and early childhood years that follow. In what seems like the blink of an eye, a tiny helpless bundle is transformed into an active, robust, and inquisitive youngster. These changes have already begun! Capture each developmental stage of the first year and beyond! 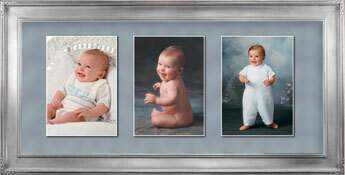 A “Baby’s First Year” portrait collection captures your child’s first milestones . . . from birth . . . to sitting up . . . to crawling . . . and finally the independence of walking. This lovely “portrait story” can become the first chapter of your child’s Portrait History — an album of priceless images of childhood — which someday your child can share with your grandchildren. Baby’s first year also is the perfect time for portraits with family members — including older siblings and even grandparents — or create the ultimate heirloom: the multi-generation portrait.